Singapore property magnate Kwek Leng Beng is in discussions to sell a parcel of land in Malaysia that could be the most expensive in the country's history, the Malaysian Business Times has reported. The roughly 32,000 square foot parcel owned by Beng's City Developments Ltd in Jalan Bukit Bintang, Kuala Lumpur could go for as much as RM3,000 (US$953) per square foot. Currently the most expensive land deal recorded in Malaysian history is Sunrise Bhd's purchase of Wisma Angkasa Raya in Jalan Ampang, Kuala Lumpur for RM2,588 (US$822) per square foot. At RM3,000 per square foot, the land in Jalan Bukit Bintang would fetch RM96 million (US$30.5 million). 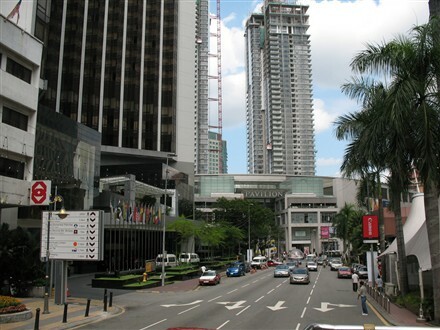 The land is located between the Grand Millennium Kuala Lumpur hotel, which City Developments Ltd also owns, and the Pavilion Kuala Lumpu shopping centre. The owner of the Pavilion is believed to be interested in purchasing the adjacent plot, as well as YTL Group. The land was originally slated to be developed into the Millennium Residences, a 42-storey luxury condo development, but construction stalled after starting in 2008, the Business Times reported.